Backyard grilling is essentially a tradition for most families and is done quite often. Now, the higher end grills can get quite pricey, usually out of the reach of most households. While you don’t need to spend a fortune on your gas grill, you still need to make a bit of an investment. This is to ensure that you get a quality product that will not only be effective but also last you quite a while. $500 is a good cut off point to find such a grill. At the same time, there are certain restrictions to be expected with grills in this price range. With this Dyna-Glo grill you get to save on space without having to compromise on your cooking area. You are still afforded 390 square inches of cooking space. There are side tables on either side of the grill, complete with hooks to makeup the ideal workstation. The tables can be collapsed to cut down on how much room the grill takes up. Each of them are capable of withstanding weights up to 25lbs. The grates offer up excellent heat retention while also directing transferring the heat to the food, making it perfect for searing. The heat created by the grill is contained within the housing as it is double lined. You will be able to keep a constant eye on the temperature as there is a built-in thermometer. The heating system consists of three burners, each with an output of 12,000 BTU an hour. The heat can be controlled with infinite setting controls while an Electro-Pulse ignition presents a quick startup option. One of the complaints regarding this gas grill is that many of the components have a tendency to rust after a short while. This Dyna-Glo model has a lot going for it. There is the main grilling space and an additional side burner as well. Combined, the five burners are capable of 50,000 BTU while the side burner boasts 15,000 BTU. The grill has been constructed to withstand this kind of heat, however. The grates, heat tents, and warming racks are made from stainless steel. 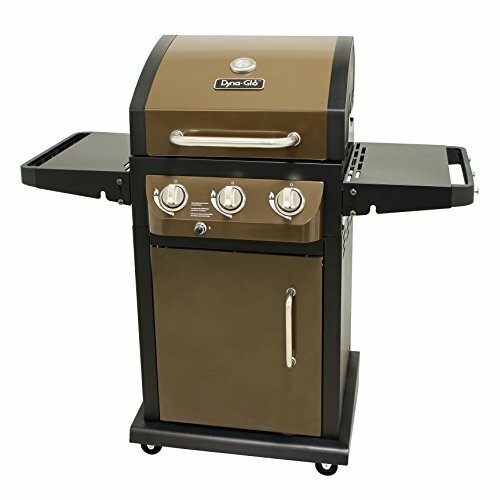 This grill utilizes an electric ignition while infinite setting control valves control the heat settings. There is a built-in temperature gauge that monitors the temperature of the grill zone. The side burner is lidded and has a variable heat range. This can be used for foods that need to be cooked indirectly or at lower temperatures. As well as the storage cabinets beneath the grill, there is a feature just for a small propane tank. Here, there is a sliding tank which allows you easier access to the tank. With this, you can even switch out the tank from the front of the grill. You should not expect a long lifespan with this grill. It may last you a couple of years or more but will begin to give out after that. If you don’t have a lot of space or are looking for a gas grill that you can carry around, then this grill is for you. While the Solaire may be compact, its size is no indication of its power. With 14,000 BTU at its disposal, this grill is capable of cooking even meats at a high temperature. The grill can be activated with an electric push-button feature. There is about 155 square inches of cooking space on this grill, plenty for at least two individuals. The Solaire gas grill is also well constructed. It is made from commercial grade and boasts welded construction. The grates as well are created from stainless steel. The rails have been made to accept different Solaire-related accessories and mounts. This is certainly a grill that has been made to move around. It weighs just twenty pounds and has a spring latch that keeps the housing closed while it is being transported around. Not to mention, you can set up this grill virtually anywhere. 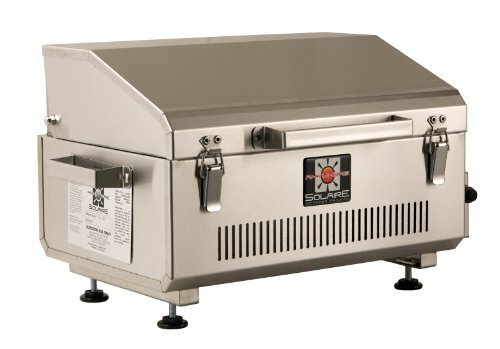 The only drawback with this grill is that there is no grease pan to trap drippings as they fall. The first thing you will need to consider is just how large you want your grill to be. It is important to be mindful of how manufacturers list out the actual grilling space available. Most companies tend to mention the space as a sum total of the grill, warmers, and sometimes even size burners. Therefore, you should always look at the individual space to determine if you are getting the right sized grill. On a similar note, you will need to ensure that you can adequately control the temperature on the grill. This will enable you to set up a two-zone cooking space – for both direct and indirect cooking. To be able to do this, you will need a minimum of two burners, although three or more will prove to be best. In addition to the BTU of the grill, you should also focus on how much heat each grill can produce. Particularly when cooking meat such as steaks, you are going to require a considerable amount of heat. Infrared and sear burners can help with attaining these high temperatures. Last but not least, you will have to consider just how well the grill has been built. Within this price range, you will be limited when it comes to both materials as well as workmanship. Nonetheless, you should for grills that are constructed from cast iron, stainless steel, cast aluminum, enamel bonded to steel, or powder coated steel. 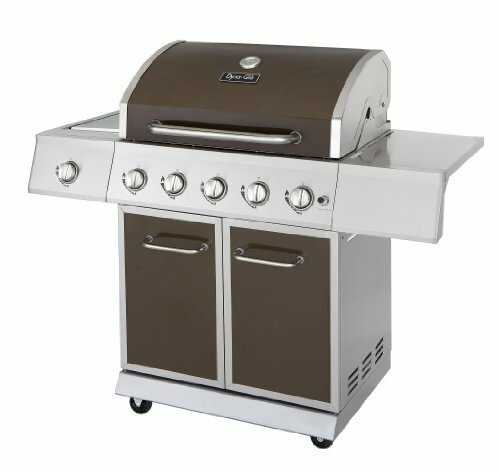 Here you can find some of best mid-range gas grills as well as a bit of help on how to find the best ones.